Listen up, members and those of you thinking of joining! Aside from belonging to a respected professional organization, you are able to confer with colleagues, attend our Second Tuesday events and panel discussions, and network. You can take advantage of our WIF grant, scholarships, discounts for WIF workshops and seminars, and our free movie offers. We supply you with valuable news, opportunities, and countless other benefits. And here are more chances to enjoy your membership status. These discounts save you money – be sure to have your WIF Seattle card ready and be familiar with the offer. And don’t be afraid to ask your favorite company to support women in the film industry by offering WIF members a discount. They may easily say yes, making you a hero(ine) to the WIF board and your fellow members! Women In Film Professional members receive a 15% discount on non commercial equipment rentals with WIF membership card and proper insurance. Koerner Camera Systems, with offices in Seattle and Portland, offers a range of motion picture gear from DSLR cameras and lenses, to small HD video cameras and high end 2K, 4K and 6K Digital Cinema Cameras, and a wide variety of lenses, accessories and support. Their knowledgeable staff can answer questions about equipment, workflow considerations, insurance and other paperwork requirements. The discount is for Women In Film Professional Members' projects and does not apply to rentals by the company the member is working for. Contact: Karen MacDonald, karen@koernercamera.com. Write that screenplay! Final Draft, Inc. offers Women in Film members Final Draft 10 for $169.00 and upgrades for $79.00. These links take you directly to the store and apply the discount automatically. Offer is good until June 2017. Scarecrow Video offers a dollar off catalogue rentals for Women in Film members. Limit: 5 per week. Music. Movies. More. Silver Platters offers Women in Film Seattle members a permanent 10% discount for WIF members Show your membership card at checkout at SoDo, Bellevue, and Northgate locations. Woman centric and eccentric short films: a venue for the female voice and narrative. Sponsored by Women in Film Seattle. PAFF offers a submission discount for WIF members and $2.00 off the general ticket price. WIF Seattle member Darci Davis, offers WIF members 20% off her rate card for graphic art services: logo design, branding, etc. Offers 20% discount to WIF/Seattle members on rental rates darkroom w/ digital workstation and Epson 7900 professional imaging printer. 20% discount to WIF/Seattle members on high-end photographic prints, museum quality fine art prints and durable indoor signage up to 24” X 96”. 100% archival inks and paper. As a member of the Business ExtrAA® Program, Women in Film Seattle can earn travel awards when members use the Women in Film Business ExtrAA Account Number 787948 when booking airline reservations on American Airlines, American Eagle or AmericanConnection. You retain your mileage awards and earn credits for WIF Seattle. See details below. As a member of the Business ExtrAA® Program, Women in Film Seattle can earn travel awards when members use the Women in Film Business ExtrAA Account Number 787948 when booking airline reservations on American Airlines, American Eagle or AmericanConnection. You retain your mileage awards and earn credits for WIF Seattle. These credits can be used to fly a female producer director, writer, DP etc. to Seattle for a WIF workshop, seminar, or forum for the education and benefit of all our members. It’s worth the sign-up. Online through www.aa.com/women: Click on “Book Now”, Select your flights and Input your Business ExtrAA Account Number 787948 in the “Business ExtrAA Account Number” box in the Passenger Details section. Call American Airlines Reservations: 800-433-1790 in the U.S. and Canada and mention your Business ExtrAA Account Number 787948. For all other locations, contact your local American Airlines Reservations office. At an American Airlines airport ticket counter: Please ask the ticket agent to place your Business ExtrAA Account Number 787948 in the “Tour Code” box. 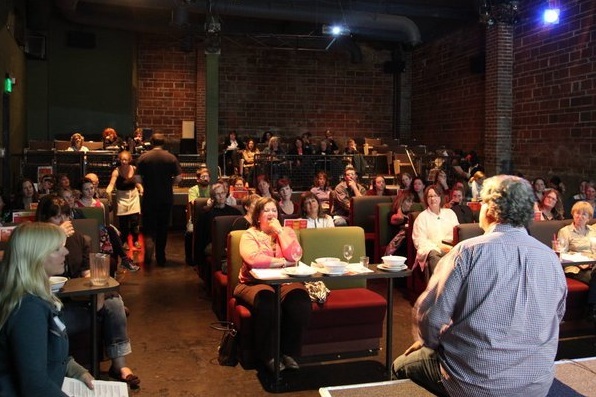 Women in Film Seattle will earn one Business ExtrAA Point for each $10 you spend to fly on eligible tickets during each month. Double revenue credit will be earned for every eligible itinerary that originates from one of over 200 airports (excludes Dallas/Ft. Worth and Miami). There is no limit to the number of points WIF can earn. Business ExtrAA Points can be earned on American Airlines published fares and are not valid with other offers. American Airlines reserves the right to change the AAdvantage or Business ExtrAA programs at any time without notice and to end either program with six months notice. Any such changes may affect your ability to use accumulated Points or mileage awards or credits. Points and mileage accrual, travel awards and special offers are subject to government regulations. ©2006 American Airlines, Inc. All rights reserved.